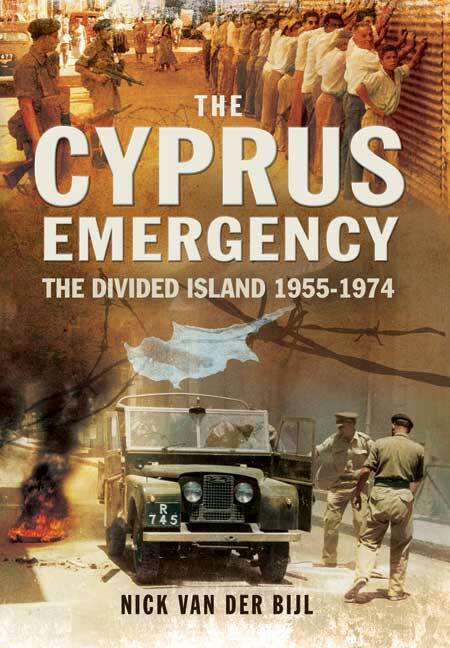 You'll be £14.99 closer to your next £10.00 credit when you purchase The Cyprus Emergency. What's this? The UK has been involved in Cyprus for over 125 years. Strategically placed in the Eastern Mediterranean, it was initially ideal for protection of the Suez Canal and more recently as a 'listening post' for the troubled Middle East and southern flank of NATO. The British faced two serious problems – the first, the Greek Cypriots' desire for Enosis, (union with Greece) and, second, the intense rivalry and antipathy between the Greek and Turkish communities. In 1955 the former resulted in a bitter EOKA terrorist campaign led by Colonel George Grivas. This resulted in the deaths of over 100 British servicemen. Nicosia's 'Murder Mile' was the scene of many shootings. The Governor Field Marshal Harding narrowly escaped assassination in his residence. Even British families were targeted. The next phase was the Turkish Government's military intervention in 1974 to prevent what they saw as the Greek take-over. In a bloody invasion which saw widespread 'ethnic cleansing' and displacement of communities, the Island was divided into two sectors policed by the United Nations. This exists today, as do the British Sovereign Base areas at Dhekalia and Akrotiri/Episkopi. This book describes the most troubled years of this beautiful island which is so well known to British servicemen, their families and holiday makers. The narrative flows from event to event with little comment or opinion allowing the reader to understand the series of cause-and-effect which brought the island to its present state. There are three good maps and a set of photographs which well illustrate the text. Despite the substantial military involvement, the Cyprus conflict and its aftermath has not attracted the attention of many authors. It could almost be consigned to the “Forgotten Wars” basket. Thankfully the gap has been filled by Nick Van Der Bijl, who generously acknowledges contributors to the britains-smallwars website, and a host of other internet sources as well among his research. This is a meticulously and exhaustively researched book which begins with a summary of the historical conflict. The author takes the reader through the formation and structure of EOKA and its leading personalities. The tension between the various elements, along with the somewhat shambolic nature of the organisation, was one of many revelations of the book. Despite the almost amateur approach to many of its operations, EOKA was ruthless in its selection of targets. Unarmed and off duty personnel were murdered in front of their families. Service wives were also deliberately targeted, including a 38 year old mother of five, shot and killed in the middle of Famagusta. There are profuse examples of the attacks on the military and police between 1956 and 1959. EOKA was equally merciless with those it regarded as informers or traitors. The brutality of the sectarian conflict between the Turkish and Greek Cypriots is also extensively documented. An influx of UK policemen, soldiers, better intelligence, improved military and police cooperation helped bring the military conflict to a close while a political solution was sought. Van Der Bijl leaves us in no doubt that EOKA was defeated, with the exhausted terrorist leader Grivas departing for Greece while Archbishop Makarios returned from exile and election to President. The involvement of the Church in providing succour to EOKA is also laid bare. The author covers the 1974 Turkish invasion which is very well described. The final chapter focuses on the casualties, whose names are listed on the island’s British Cyprus Memorial. This book tells their story.